It’s simple to make and throw together and makes an excellent lunch, even in the winter. While it probably tastes best with fresh, ripe tomatoes, it can be made with a decent brand of canned tomatoes (and always, of course, with your own) in a pinch. Though this recipe came about as another way to use up stale bread, I like to take fresh bread and toast it up into garlic bread just for this salad. Yum. If the baguette or french bread isn’t too stale, slice it up and toast it. I like to spread butter or olive oil on top followed by a sprinkling of my garlic bread spice mix (dried parsley, granulated garlic, salt) before toasting. Let cool enough to handle, then chop up into bite-size pieces. If the bread is already nicely stale, chop it into bite-size pieces. If using canned tomatoes, drain the tomatoes and reserve the liquid. Toss the bread cubes with the liquid in a medium bowl so they’ll begin to soften. 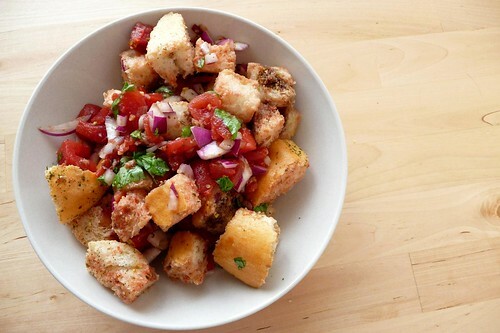 If using fresh tomatoes, chop tomatoes then toss with the bread cubes. Combine drained tomatoes (if using), basil, bacon, capers and red onion with the bread. Drizzle over with balsamic vinegar and olive oil, add salt and pepper to taste, then toss well. I don’t bother peeling fresh tomatoes, but if it bothers you, blanch them and peel them before chopping. Any fresh herb will do here. I like basil for its peppery tanginess, but fresh oregano, thyme or marjoram would all work well, as would parsley. Adding a chopped roasted red pepper or some minced anchovy would also be good. This entry was posted in bread, dairy-free, italian, recipes, salad, untranslated, vegetarian. Bookmark the permalink. I’ve to say yours is much better than the one I had at a restaurant yesterday. Mine only came with halved grap tomatoes, green beans, and red onion. I’ve a question – do you have to put olive oil on the bread? Is that the tradition? I find it a bit heavy for me. While olive oil is traditional, tradition is no reason to eat something you don’t care for. Sometimes I drizzle just a teensy bit of extra-virgin over it myself. If you find the oil too heavy, leave it out or cut it back to the barest drizzle if you miss the flavor, but don’t omit the balsamic. another tuscan friend butting in…bread must be placed in cold water, in chunks, you should then use your hands to crumble it – it shouldn’t however end up too crumbled! Normally the bread is almost the same size of the vegetables..
there are very simple rules that make the difference. Love your picture! Oriana: It seems everyone has their own ways of doing it! I like yours better than his, I think, since I don’t have to dirty up my grinder. :) Thank you!